In one of my previous post, I had mentioned our love for Chinese food. It is easy to fix a Stir fry or rice for dinner when time is a constraint. So my pantry always has a stock of Chinese condiments. Trial and error in my kitchen with Chinese recipes had yielded several mishaps and success. One among them was the Szechuan Shrimp or Szechuan Chicken and I believe I got a fairly good grip on the technique to make this dish by now and it was endorsed by my hubby!! We have a Chinese carry out place close to our house, which is at a walking distance from my daughter's eye clinic. Whenever I had to take her to the doctor, I could never pass the Chinese place without buying the dinner. The aroma that waves around that area is strong enough to tickle my palate and tempts me to get something from there. To enforce my urge to buy Chinese food, kids impel me to do so and we end up having Chinese dinner. It always amazes me to watch how the cooks toss the vegetables, splash the sauces without even measuring into the big wok and vigorously stir frying the dishes yielding a quick and lip smacking meal. Peeking at the cooks how they perform their culinary tactics while chatting to the lady at the store is one thing I enjoy while going there. If you never tried making Chinese food at home, its about time to try your culinary skills and I am sure you will not be disappointed. Mix all the ingredients for the sauce and keep it aside. In a wok or cast iron pan, add 1 tsp of sesame oil and add the vegetables and stir fry on high heat for 1- 2 minutes. Add salt and pepper flakes to season. Remove from heat and transfer to a plate. In the same wok add 2 tsp of sesame oil and cook the garlic and ginger till golden brown. Add the shrimp, salt and pepper flakes and cook till shrimp is half done. Add the sauce into the shrimp and lower the flame and cook till sauce gets thicker. 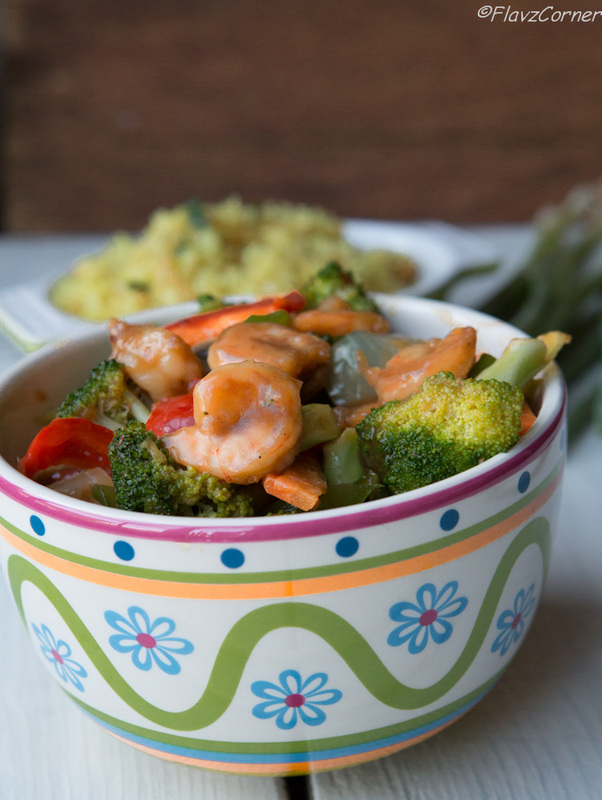 Add the stir fried vegetables into the shrimp and give a good stir and turn off the heat. 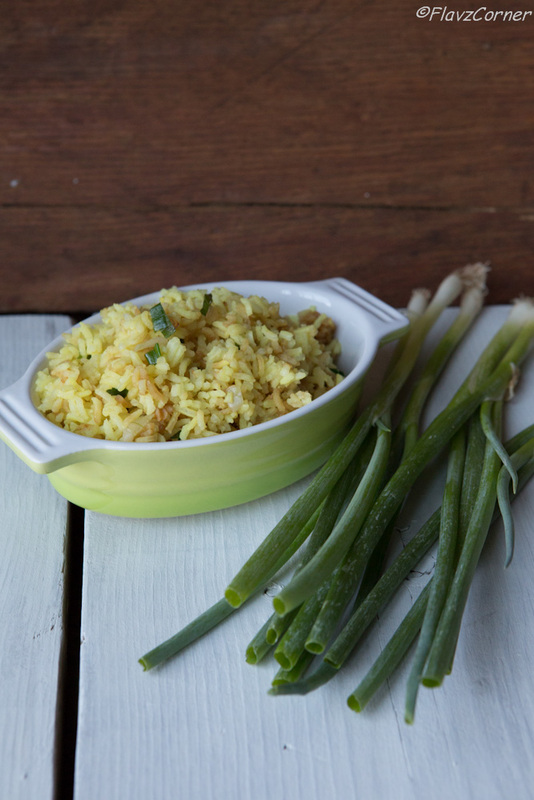 Garnish the Szechuan Shrimp with chopped scallions and enjoy with chinese fried rice. 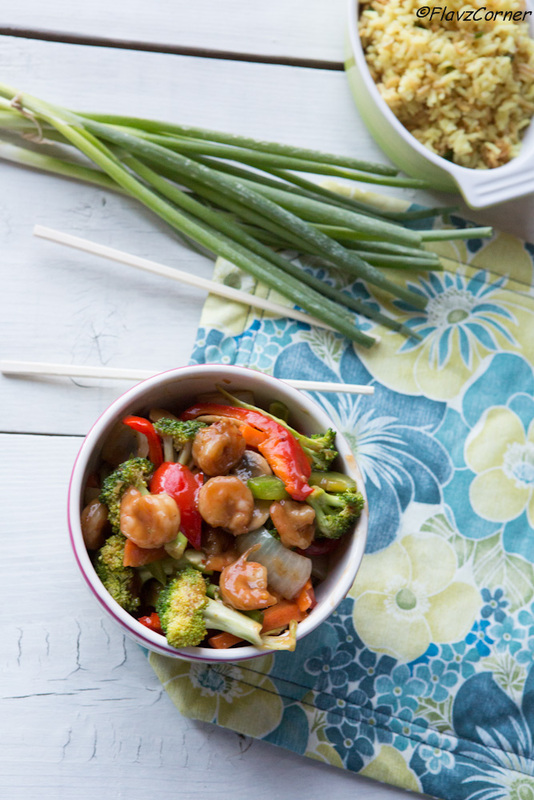 The key in making stir fries is to use high heat and less oil. A wok or cast iron pan works better in this case. Don't over cook the vegetables. They need to be crisp and crunchy for this dish. You can use any meat of your choice in this dish. Adjust the pepper flakes as per your spice level. Thanks Vineetha for the comment!!! Have a safe trip!!!! Hehe....i know Chinese food is tempting and its good to make excuses to buy it ;) This shrimp dish looks yum! soo very tempting Shibi...i really admire oyur photography skills..nice presentation.